Yes, I think my novel, Difficult Lies, would make an excellent movie. And I think my short story collection, Girlfriending, has stories that could be developed into miniseries and/or feature length films. To that end, I have mailed a copy of Difficult Lies to both Matthew McConaughey (back in February 2017, so I pretty much have given up on him) and Clint Eastwood (he just got his copy two weeks ago, so my fingers are still crossed). There is no way I know of obtaining their personal mailing addresses, so I found the name of a club where Mr. McConaughey plays golf, and the name of a club Mr. Eastwood owns. Addresses of the golf clubs were easy. The books arrived, but whether or not either of them ever had them in their hands is up to question. In the case of Girlfriending, Alan Alda was in Toledo for the Author! Author! series, and Karen and I (and a couple thousand others) paid for a copy of his new book and an entertaining evening of stories and recollections he shared from his career. We hung out afterwards (with five hundred or so others) to get our copies of his book signed, and Mr. Alda soldiered through and signed every last one. He was gracious and friendly. I shook his hand and said, “I’m certain I’ll enjoy your book, Mr Alda, and I hope you enjoy mine.” At which point he smiled, took Girlfriending and handed it to a security officer who placed it on a pile of other things he’d been given. Yeah, nothing from Mr. Alda, either, as of this writing. But hey, if you want to catch lightening in a bottle, you stand in a storm. It’s easier to engineer a storm than to find one. An addendum: It is Christmas Day 2018 and as of this writing, I have heard nothing from Matt McConaughey or Alan Alda, and the copy of Difficult Lies I sent to Clint Eastwood was returned unopened. That protects him from lawsuits if he ever does a golf movie in the future–understood. Anyway, no lightening. Dang. Just a REAL casual reminder that I will do some reading from, and sign copies of Girlfriending from 2:00-4:00 this Sunday, 12 November. Gathering Volumes is located at 196 E. South Boundary St., Perrysburg Ohio. I’ll be eager to see some old friends, and make some new ones. If you already bought a book on Amazon or B&N, bring it and I’ll sign it for you. And remember, if you already bought a copy, Christmas is coming and a book makes a great gift. Especially a book you really loved. I mean, you really loved Girlfriending, didn’t you? Seriously, I’ll be eager to see you. And I’ll have copies of my novel, Difficult Lies, available as well. See you Sunday! This coming weekend I am going to be at the Southeastern Wisconsin Festival of Books, in Waukesha, WI, as a presenter. On Friday I will be talking with/to two creative writing classes at Arrowhead Union High School in Hartland, WI. I’m really excited about this. I haven’t been in a high school classroom in seventeen years. Then on Saturday, a writer named Chip Duncan and I will do an hour-log seminar on writing the short story, after which we will (I hope) sell and sign some books. Very exciting for me. Never in my life would I have envisioned anything like this when I first started hooking words together. Life takes curious twists. Just today I recieved confirmation of an interview with Fred LeFebvre (pronounced ‘LeFever’) Wednesday, October 25th following the 8:00 am news break on WSPD, 1370 AM, Toledo. I contacted Fred regarding my short story collection, Girlfriending, and my reading and book signing coming up November 12th at 2:00 pm at Gathering Volumes book store in Perrysburg. Fred was kind enough to offer me some time with him on his Morning Show on WSPD. So, will I freeze up and be unable to utter anything other than unintelligable grunts? Will I stutter and stammer? Say something bleepable? Forget the title of my book? These, and many other questions will be answered next Wednesday morning. For those of you outside our listening area, WSPD is on iHeart. For those of you within the listening area who may be predisposed at 8:07 or so, he may pod-cast it. I’ll of course let you know. Of course I’ll remind you again. You know me by now. Christopher T. Werkman, a life-long Toledo area resident, will read from and sign, Girlfriending, his newly published collection of short stories at Gathering Volumes book store Sunday, November 12, from 2:00 to 4:00 pm. Gathering Volumes is located at 196 E. South Boundary St., Perrysburg, OH 43551. *A detective known for bold courage on the job deals with mental and physical abuse by his trophy wife. *A woman strives to overcome the PTSD she brought back from battlefields in Iraq so she can become a loving partner. *In the title story, a socially dysfunctional Toledo Jeep worker “girlfriends” women he “meets” in obituaries. From liaisons that are real to those that are imaginary or somewhere between, Werkman skillfully creates characters who find themselves in situations that will fascinate and amuse. Girlfriending has received 5-star reviews on Reader’s Favorite and Amazon’s web sites. 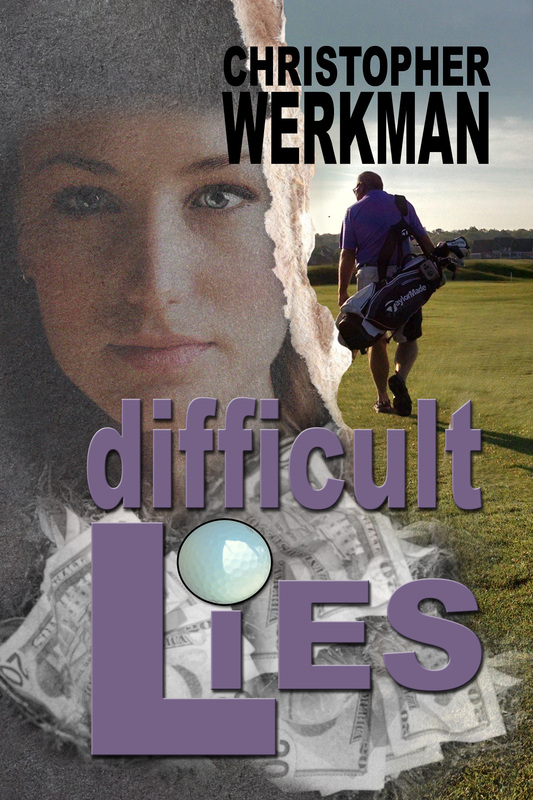 Rogue Phoenix Press, Werkman’s publisher, also published his novel, Difficult Lies, in 2015. Christopher T. Werkman was born in Toledo and graduated from Perrysburg High School. After attending Adrian College, Werkman taught art for 30 years for Washington Local Schools. After retiring from Whitmer High School, he was an adjunct instructor in art education at University of Toledo. Werkman still paints, but his passion is writing fiction. He and his partner, Karen, live on a few acres near Haskins, Ohio. Werkman painted the image used on the front cover in 1983, and it won First Award/Painting in The Toledo Area Artist’s Exhibition. Last night, my sweet lady Karen treated me to an evening with Alan Alda. We each got one of his new books on improving interpersonal communication, and were treated to his warm and affable musings, humor, and instruction on helping others better understand what we mean to say. By The Blade’s count, 2,424 people were in attendance. Wow, I thought. If I ever sold a fifth of that number of books I’d be bowled over, and this was just one stop on his tour. Afterwards, Mr. Alda was kind enough to stay and sign books for hundreds of people. Karen and I lined up, and in about 45 minutes we made it to his table. He had a smile for each of us, and a handshake for me when I offered. As he handed me his now-signed book, I handed him a copy of Girlfriending, also personalized for him. “I know I’ll enjoy your book, Mr. Alda,” I said. “I hope you’ll enjoy mine.” He smiled genuinely and thanked me. I hope he reads at least a story or two. Pie-in-the-sky, I hope a few lure him into reading them all. But knowing Alan Alda has a copy of Girlfriending in his possession warms me. I submitted my short story collection, Girlfriending, for reviews at Reader’s Favorite, an online forum authors and people who like to read. I now have three reviews, all 5-Star, and quite frankly, the reviewers make Girlfriending sound better than I believe I could. If you’d care to take a look, go toreadersfavorite.com and search my name or Girlfriending. I’m thrilled. At long last (I can hear your collective sigh of relief) we reach the twenty-sixth and final story in my collection, Girlfriending. “Stupid Little Noise” is written in second person. The protagonist is “you.” I like this point of view because it puts the reader in the story. “You” are the one living the plot line. In a perfectly written second person story, the reader wouldn’t know if the protagonist was male or female, but in “Stupid Little Noise” the protagonist is male. He is wealthy. He is quite self-centered, and proud of his station in life. He is probably a bit unlikable. What could possibly change our opinion of him, or his opinion of himself? Is it possible? Read “Stupid Little Noise” to see. I hope you have enjoyed reading these short synopses of my stories as much as I have enjoyed writing them. I tried to stir interest without revealing too much. Hard to do. I hope you may be stirred to buy a copy of my collection. I think if you do, you will be happy with what you read. Yeah, objectivity from the author, LOL. The next to last and twenty-fifth story in Girlfriending, my just-published short story collection, is a story called “Taking Trophies.” Dalton Hill is dealing with the recent death of his wife, Leetha, and with concerns about his own memory. He wants to stop at Leetha’s grave on his way to a gun show where he plans to sell a couple WW II guns to raise money for a new riding mower. A snow storm sets in as he leaves his house, and Dalton drives into more than just a blizzard. For those of you who don’t already know, the painting on the cover of my short story collection, Girlfriending, is one I painted in 1983. It won First Award/Painting in the Toledo Area Artist’s show. When I first conceptualized putting a collection of “relationship” stories, that painting immediately came to mind as the perfect image for the cover. My publisher agreed. So there it is. Cool.